Former Britcar Series Winners Harry Handkammer and David Leslie used all their endurance skills in the GTS Motorsport BMW M3 to take a magnificent victory in Saturday evening’s four-hour combined Britcar / ProductionS1 race, finishing a lap ahead of the Porsche GT3-RS of Peter Cook and Franck Pelle. And it didn’t rain. At all. 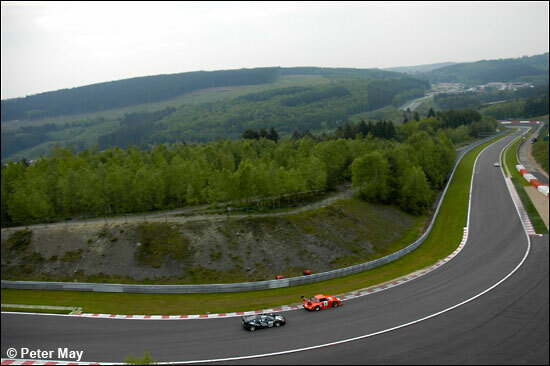 For those who haven’t visited Spa before – and that, surprisingly included veteran commentator Brian Jones – the sweeps, undulations, and general vista are breathtaking. Any TV footage that you have seen, even the best pictures in books or magazines, leave you ill-prepared for the sheer majesty of the place. That said, the spectator areas and facilities are redolent of a third-division football ground, and it’s small wonder that Bernie has taken it off the F1 calendar. Saturday morning’s 45-minute qualifying session had seen first the GTS Motorsport BMW at the top, then the Cook / Pelle Porsche, then Peter Hardman, in the Bilmo BMW GTR, lowering the target to 2:33.414. Once Richard Chamberlain climbed into his Porsche 935, however, things changed, the orange car posting 2:21.037 on its first flying lap; “Straight on the case, straight on the pace,” according to Brian Jones, who, incidentally, was a bastion of British work-ethic in a box of Belgian waffle. The three mandatory pit stops meant little to Richard Chamberlain and John Allen, for they would need to come in seven times to refuel the thirsty Porsche. Peter Hardman was sharing the Bilmo BMW GTR with relative novice Nick Leventis, son of the owner of the collection of historic race cars that Hardman regularly drives. Adam Sharpe was stopping-off between his Australian exploits and the Le Mans test weekend. Peter Cook had brought along his red Porsche – the car seen previously in occasional British and FIA GT races. 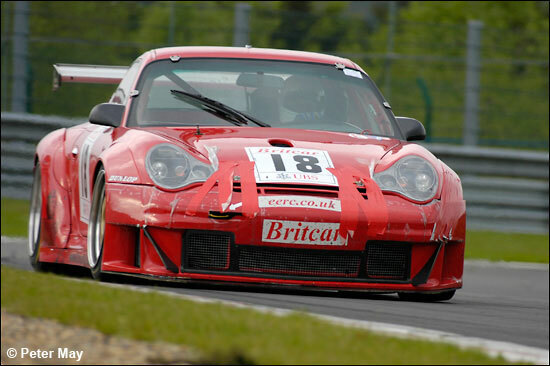 “This is the car we always intended to run in Britcar. We’ve removed the turbo, so it’s now naturally aspirated, and we should be able to get away with three pit stops,” he explained. Ben Aucott was sharing the Red Bull BMW M3 of the crack Duller team, with Joe Macari. Mark Lemmer’s Honda Integra was a newly-built car, intended for some extra-curricular fun away from Barwell’s GT programme, and the returning Andy Demetriou was nursing a hand injury. Phil Cutts hadn’t raced since Zolder last year, and nor had his M3, but, having joined forces with Kevin Clarke’s Intersport team for the weekend, it was determined that both Clarke and Ian Donaldson would share the car, as well as their usual 320i. The Colin Wilmott / Barry Benham / Guy Gerrish BMW M3 was the old GTS Motorsport car used by John Cowgill and Calum Lockie, and the MG series frontrunners were being run by the ex-MG Sport & Racing team. 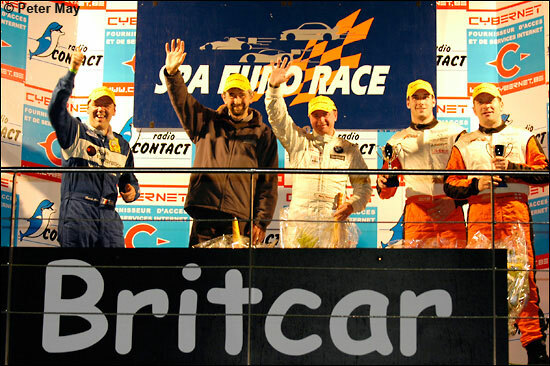 With the Britcar contingent installed in the Grand Prix pit garages, and with no visual or oral communication between the pit lane, commentary box and press office, this was going to be a difficult race to follow, with some guesswork and assumptions made. As the cars filed out to form up on the grid, there was disappointment for David Cuff, the Metcalf BMW stopping out on the circuit with a suspension problem. At this stage of the proceedings, recovery was possible, leaving a glimmer of hope as the car was loaded onto a flat-bed. Chamberlain went into an immediate lead at the green lights, with Sharpe on his tail, but Peter Hardman had made a quick getaway, and, with Cook’s Porsche snapping at his exhaust pipes, made a move on Sharpe, too. Adam was having none of it, though, and got back ahead before the first lap ended. David Leslie had taken Cook as well, and as they came out of La Source, Chamberlain, Sharpe and Hardman powered down the hill in line, then a short gap before Leslie and Cook. 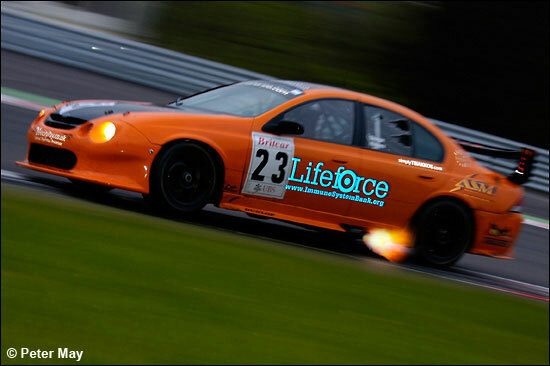 Ben Aucott overdid it at La Source on lap two, hitting the tyre wall, and ending the race for the Duller BMW. Chamberlain and Sharpe, with just a quarter of a second separating them, had left Hardman in a lonely third. In ProductionS1, Kevin Clarke had hauled the Cutts BMW up to ninth overall, leading the class in front of Mark Lemmer, and Michael Symons’ Geoff Steel BMW. Chamberlain had stretched his advantage to nearly four seconds, but as the leaders hit traffic eight laps in, Sharpe closed the gap to less than a second again. The two orange cars, nose to tail, are becoming familiar in Britcar races, but so, too are punctures, and with just 10 laps done, the Porsche 935 was in for the first of what would be several tyre blow-outs. Rejoining 15th, Chamberlain faced an almost impossible task to get back into contention. Good news, though, for David Cuff, who joined the race eleven laps down, the sheared wishbone bolt having been replaced on the BMW M3. There was a scare for Doug Newman at the worst possible place. With smoke billowing from the rear of the Marcos Mantis as he entered Eau Rouge, he spun on his own oil, backwards into the Armco. 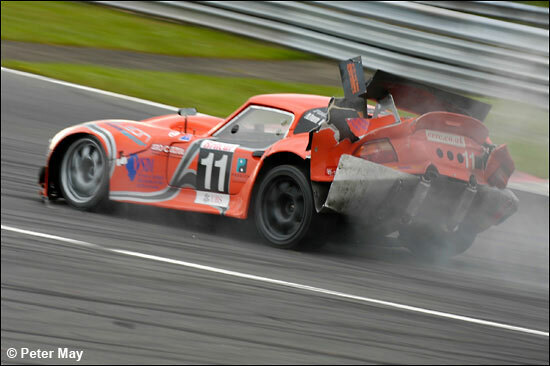 He crawled back to the pits to retire, rear heavily damaged, and wing askew. John George, in the Mardi Gras Honda Civic, had been scrapping with Peter Heintzelman’s Astra, and was bearing the scars on the back bumper. Sadly, the Civic would retire after 23 laps, leaving Phil Bennett without a drive. As the first hour passed, Sharpe held a lead of 35 seconds over Hardman’s GTR, with David Leslie holding it steady in third, a further 13 seconds adrift. Anthony Mott was doing a sterling job in the Simpson Motorsport BMW, fourth, and the last car on the lead lap. 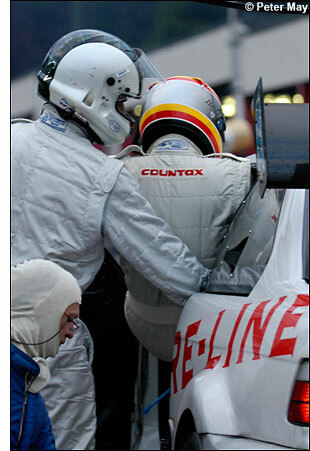 Craig Cole’s Damax Ferrari was fifth, followed by Franck Pelle, who had relieved Peter Cook in the red Porsche. Chamberlain had hauled the 935 back up to seventh, though two laps down, and David Back had atoned for a poor grid positioned, the black Damax Ferrari 360 now in ninth. Jon Harrison had parked the #4 Topcats Marcos out on the circuit. 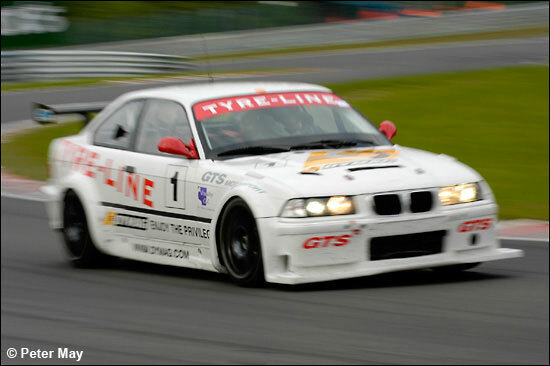 In ProductionS1, John George temporarily held the lead, but would soon retire, with the impressive Colin Wilmott BMW second, and the Barwell Honda third. Ian Donaldson had retired the Intersport BMW after an electrical fire, so now he and Kevin Clarke were concentrating their efforts on the Phil Cutts M3, which was 12th overall. The second hour saw both Peter Hardman and David Leslie assume the overall lead as pit stops were taken, and Anthony Mott had the BMW up to second before handing over to Jeff Wyatt. So, at the halfway stage of the race, and still a pleasant evening, it was Handkammer’s BMW leading, followed by George Haynes in the ASM Falcon, Jeff Wyatt’s BMW, then Nick Leventis in the GTR. 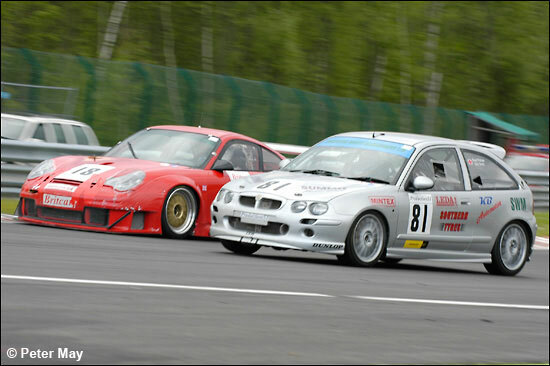 The two Porsches of Pelle and John Allen were fifth and sixth, then the leading PS1 car, the amazing Cutts BMW. Phil had initially doubted his fitness to race before the event, and was on the cusp of withdrawing, but was now in the middle of what would be a masterful 90-minute stint, and the car was now leading the Barwell Integra, and the Wilmott / Benham / Gerrish M3. 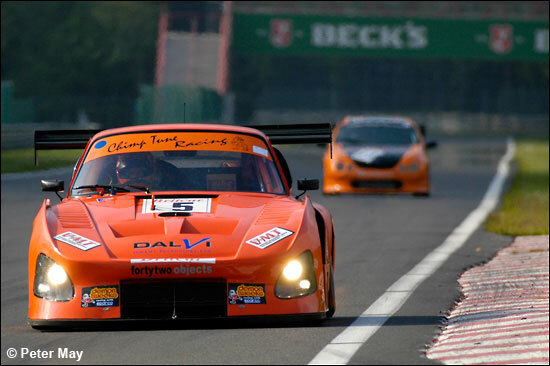 The Cole brothers Damax Ferrari had now retired with clutch problems, and the Topcats Marcos Mantis had taken a stop / go penalty for a pit lane entry infringement. The third hour saw the white GTS Motorsport BMW retain the lead through a round of pit stops (Leslie to Handkammer, right), but the Falcon was eating into its 10-second lead to the tune of a second per lap. 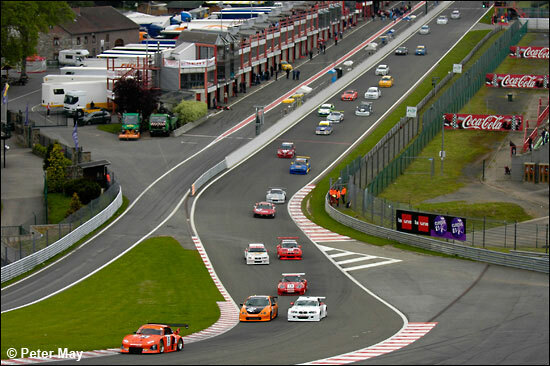 It’s a long lap round Spa, though, and the Falcon’s progress was halted, with 90 minutes to go, by another pit stop. Richard Chamberlain called it a day now, the third puncture having damaged the bodywork. “One puncture at Silverstone, two at Snetterton, and three here – and it’s always the sidewalls, not the tread,” exclaimed Chamberlain. The Simpson BMW retired out on the circuit, with an unknown fault. “They wouldn’t recover us back to the pits, so we don’t know what the problem was – could have been fuel,” snapped an angry Tony Rodriguez after the race. As the race entered the final hour, it was still Handkammer / Leslie in front, with the Sharpe Falcon still in touch, half a minute down. The Hardman / Leventis BMW was third, two laps down, followed by Cook / Pelle on the same lap. Lemmer and Demetriou were making ProductionS1 their own, fifth overall, and a lap in front of the Cutts / Clarke / Donaldson BMW. The Wilmott BMW was next, and Gary Smith and Stuart Plotnek had brought the class-leading MG ZR into eighth overall. Davids Back and Foster were struggling with no power steering in the Damax Ferrari. Shoring-up the top ten, and keeping their powder dry, were Mick Mercer and Rupert Bullock in the Topcats Marcos Mantis. This was to be no cruise to the flag, though. The usually consistent Handkammer / Leslie BMW was atypically erratic in its lap times, and the Falcon actually drew up to sniffing distance, before needing yet another pit stop. Once refreshed, the Falcon got back onto the same lap again, but with half an hour left, a 70-second deficit was a bit too much to make up. 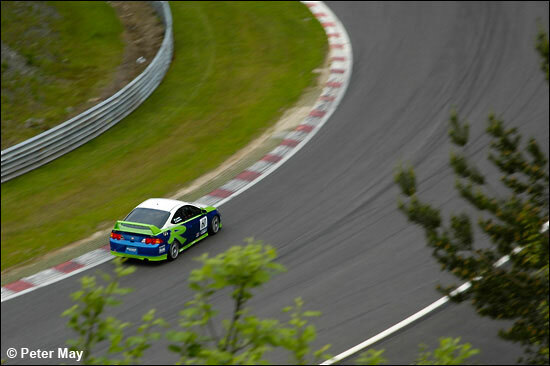 Cruel luck saw the Hardman / Leventis GTR stop out on the circuit with just 15 minutes left to run, and the Barwell Honda Integra risked losing the ProductionS1 lead by making a cautionary fuel stop, rejoining just eight seconds in front of Ian Donaldson’s BMW. It was now around ten o’clock, and virtually dark. And there was drama in the darkness. Adam Sharpe had come across two squabbling back-markers, and his attempts to lap them had seen him in heavily into the Armco. The Falcon limped back to the pits, crawling across the line to finish the lap, and Steve Kent’s Astra exhibited damage too. Mark Lemmer had responded to the threat from the #83 BMW, and now Rupert Bullock was making a final dash for glory, the Mantis having taken Donaldson and the Back / Foster Ferrari in the last quarter of an hour, and on the last lap, the Barwell Honda too. Harry Handkammer, now conserving fuel, took the flag, having completed 89 laps. “It’s good to win here, on such a phenomenal circuit,” he said. And those inconsistent lap times? Adam Sharpe and the ever improving George Haynes, despite the late accident, had done enough to be classified third, and it was jubilant Mick Mercer and Rupert Bullock fourth. Mark Lemmer and Andy Demetriou were fifth, heading the ProductionS1 runners, then David Back and David Foster in the black Ferrari, searching for gears towards the end. Kevin Clarke and Ian Donaldson salvaged their race by helping bring Phil Cutts’ BMW home seventh. Gary Smith and Stuart Plotnek won the “baby” class in the #81 Mickel Racing MG ZR, eighth overall, and the Paul Horton / Mark Cunningham Seat completed a steady race in ninth. The endurance-spec Mini Cooper of Paul Harvey and Alan Maynard finished tenth overall, and runner-up in Class 3, despite the team’s earlier doubts. Colin Wilmott, Barry Benham and Guy Gerrish are not MG front-runners for nothing, and they acquitted themselves well in the ex-GTS BMW M3, though a progressive loss of gears through the race saw them left with just fourth gear towards the end. It was “what might have been” for the Metcalf BMW E30, the last car to actually finish on the road, and posting the fastest ProductionS1 lap, after starting the race 11 laps down. “We could have been on the overall podium,” rued Fergus Campbell. The GA Motorsport Vauxhall Astra had a race full of incident and accident, their quartet of US and UK drivers getting to grips with European circuits, after previously racing exclusively in the Middle East. The all–girl MG ZR of Kelly-Anne Smith and Sarah Bennett-Baggs encountered problems towards the end of the race, but was classified 15th. Well done Steve Wood for keeping up with the action throughout an eventful evening - and special praise to Peter May, who shot these images at Spa, then drove through the night to Le Mans, and captured some of the images you might have seen from that event. It was quite a weekend for all of us, trying to bring reports from three European meetings.